Chocolate, fudgy homemade Cherry Chip Brownies! 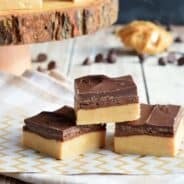 These two bite brownies are sweet and adorable for Valentine’s Day! Valentine’s Day is just around the corner…you know, the day people either hate or love. Personally, I’m kind of indifferent. Having been married almost 22 years (OMG!! ), we don’t usually do anything special. If it falls on a weekend, we’ll occasionally go out to dinner, but for the most part it’s business as usual around here. I’ll usually make a nice dinner, and some sort of sweet treat for dessert (like these Chocolate Almond Cheesecake Parfaits), but otherwise our evenings are usually filled with our daughter’s sporting events and practices! Know what’s even more lame? 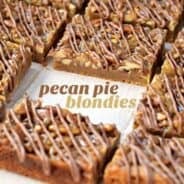 As a food blogger, we tend to create our recipes way in advance. So while everyone was eating healthy in January I was working on making these Cherry Chip Brownies. I’ve even got a couple of Easter recipes tested and ready to go for March! It’s confusing when you live in the house of a food blogger. You eat Thanksgiving Dinner in September, and Christmas cookies in October. But, the best part is we get to make these again for Valentine’s Day. 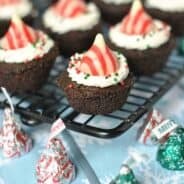 The homemade, fudge brownie bites are wonderful. I love this silicone brownie pan (I use it for my homemade English Toffee recipe too). 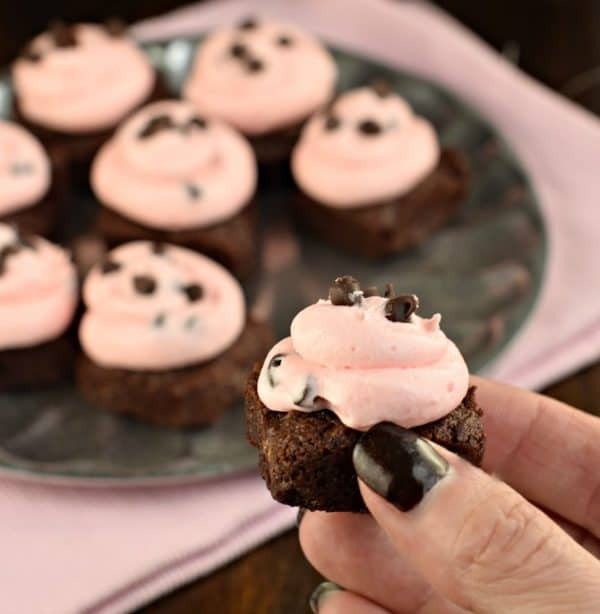 But you can use a mini muffin pan too if you have one on hand! And the frosting….SWEET goodness! I could eat a jar of maraschino cherries in one sitting, so using the juice in the frosting is delicious. You can even add some chopped up cherries to give it even more cherry flavor. You just may need to add a little extra powdered sugar to thicken it up!! 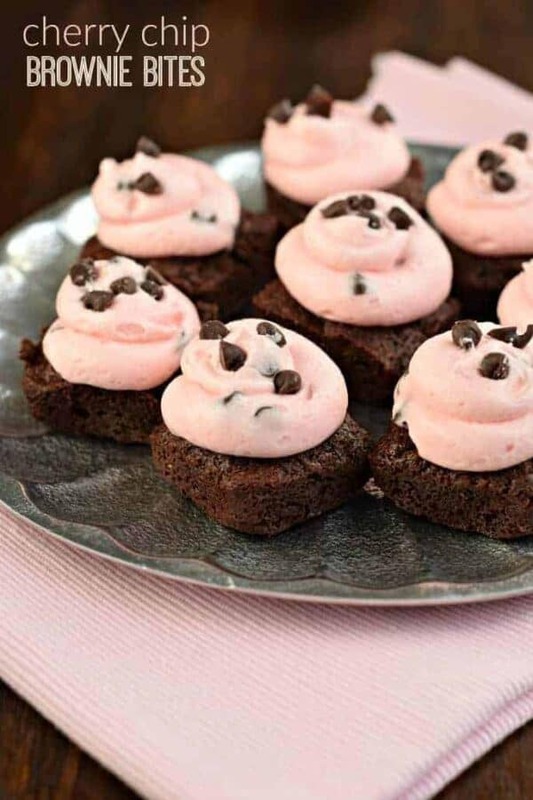 Or, just put a cherry on top of each brownie bite, that works too!! Chocolate, fudgy homemade Cherry Chip Brownies! 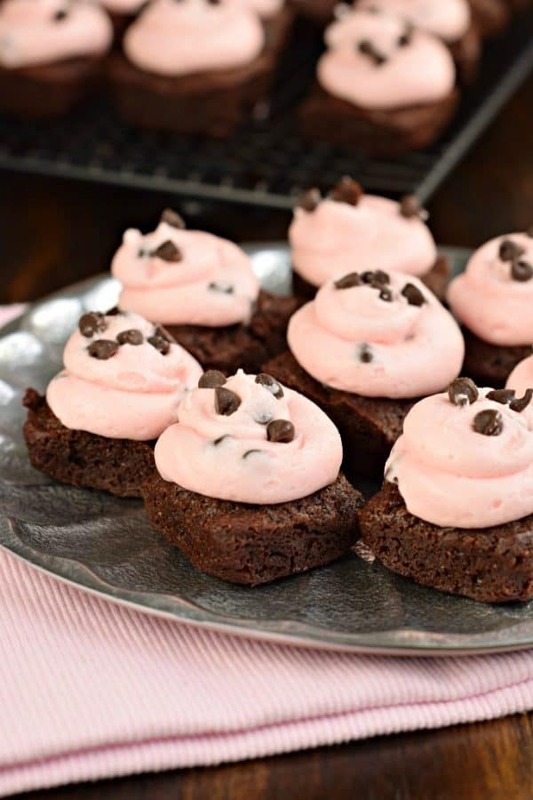 These two bite brownies are sweet and adorable for Valentine's Day! In a large microwave safe bowl, combine the butter with chocolate chips. Heat for one minute on high. Stir and microwave for another 30 seconds. You may need to stir and heat for one more round of 30 seconds until fully melted. Add sugar, flour, eggs and salt. Stirring until well blended. If using a silicone mold, you don't need to grease it. (If you are using a metal pan, you may want to lightly grease with baking spray). Drop batter by large tablespoons until evenly divided into pan. For the frosting, beat butter for 2 minutes. Add powdered sugar and maraschino cherry juice. Beat an additional 3-4 minutes until light and fluffy, scraping down the sides as necessary. **if desired, add about 1/4 cup chopped cherries to the frosting, increasing the powdered sugar as needed to give desired consistency! Or add a maraschino to each brownie bite on top! 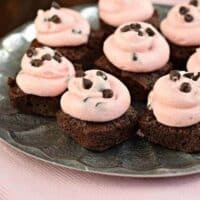 Brownie bites are perfect for those of us who love a sweet treat, but just want a taste. 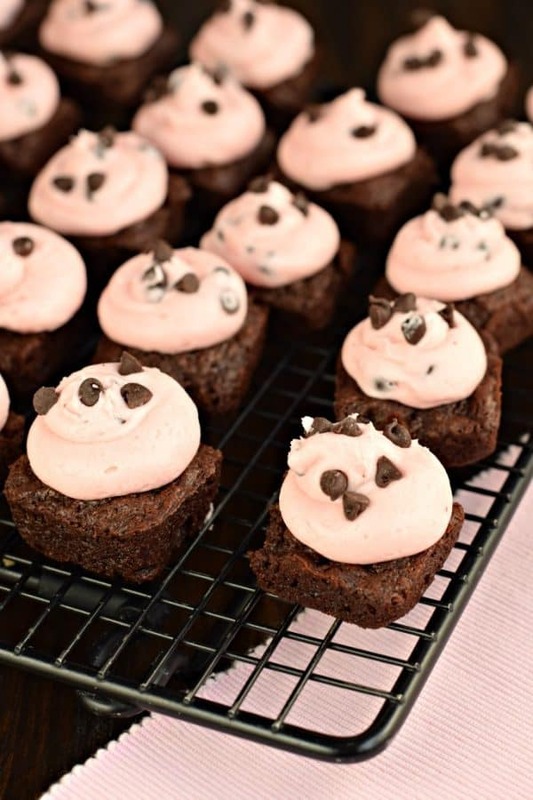 I love this recipe for Valentine’s Day! Yum! Cherry and chocolate are such a great combination! Great combination Cherry and chocolate, i can feel the taste .